RENO — Boulder City players were lining up into two rows in front of the net for a team photo with the state championship trophy when someone hollered out, “Back to back!” Whether that was a command, or merely an observation, the Eagles’ players took it to heart, pairing up to stand back-to-back for the photo. 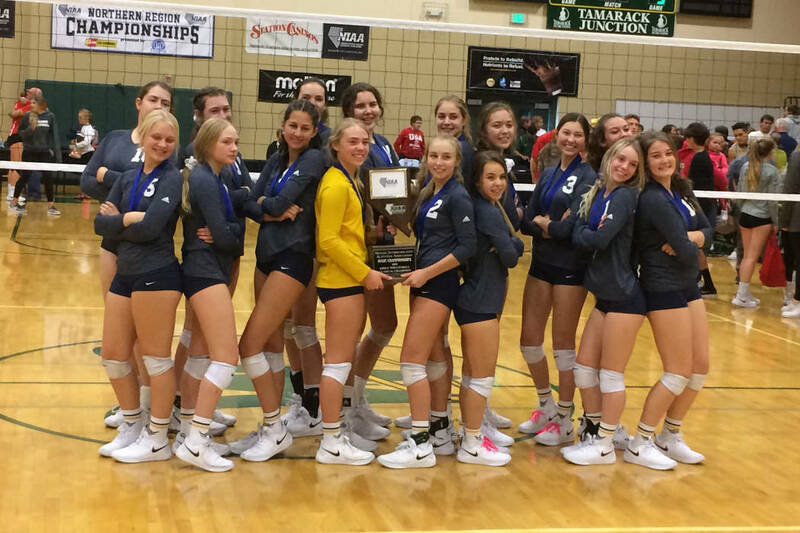 The Eagles are two-time defending Class 3A state champions, beating Truckee 25-17, 25-18, 21-25, 25-18 in the championship match Saturday at Bishop Manogue. Bailey said the Eagles (38-6) dealt all season with the added pressure of being defending champions, but if so, they didn’t show many signs Saturday. Players were laughing and dancing throughout pregame warmups, and during almost every break in play. 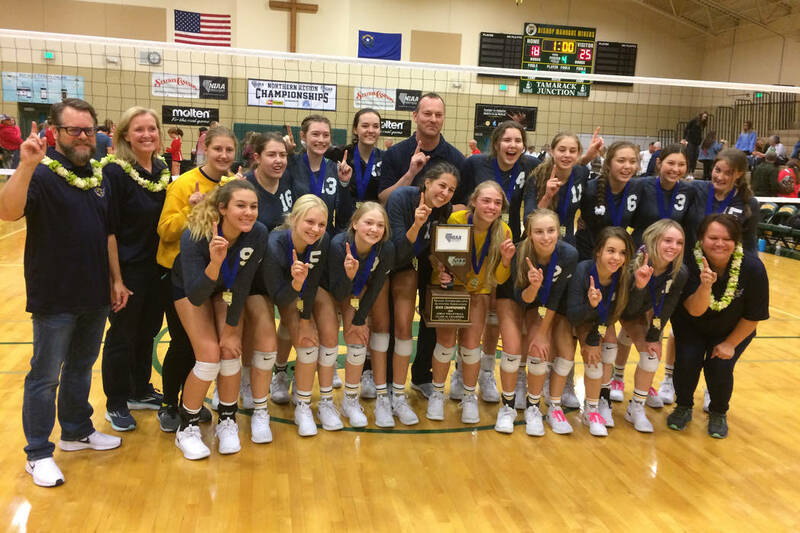 And when things started to tighten up, Wright credited the experience of last year’s championship run, which culminated in a five-set win over Moapa Valley, in helping keep the Eagles grounded. “I was definitely a little scared, but I knew could get back to being ourselves going into the fourth game and take it from there,” Wright said. Truckee (29-6) seemed to gain a spark toward the end of the second set, when they cut a 23-13 deficit to 24-18 before going down 2-0, and the Wolverines played with renewed vigor in taking the third set. In the fourth set, Truckee closed to within 6-5, but the Eagles ran off 10 of the next 14 points to take a 16-9 advantage. Truckee got back within 19-17, before Boulder City closed it out with a 6-1 run. Kamry Bailey led the Eagles with 19 kills, three blocks and eight digs, and Wright had 40 assists, 15 digs, three aces and four blocks. Setia Cox had 10 kills, Sierra Orton had eight kills, and Reagan Herr added six kills for Boulder City. Dani Mason had 24 kills, 17 digs, five aces and five blocks to lead The Meadows to a 21-25, 25-20, 25-23, 25-17 win over Yerington in for the Class 2A state title. It’s the second straight and sixth overall state title for the Mustangs (28-7), who also defeated the Lions (31-6) in last year’s state championship match. Anna Dorn added eight kills, five aces and 18 digs, and Ella Moscoe had 13 kills, seven digs and three blocks for the Mustangs. Mira Gollard had 41 assists and 13 digs, and Ilana Cohen and Vivian Pallares each added 13 digs for The Meadows. Yerington saw its 21-match win streak snapped and lost for only the second time this season to an in-state opponent. The Lions fell to Class 4A Carson in an opening weekend tournament. Pahranagat Valley rallied for a 22-25, 25-21, 25-13, 25-13 victory over Virginia City in the Class 1A state title match. It’s the third consecutive state championship for the Panthers, and first for head coach Milly Walch, who took over the program from long-time coach Ginger Whipple.